Did you know: it’s easy to tell if a box meets industry standards, just look for the Manufacturer’s Certification Stamp. 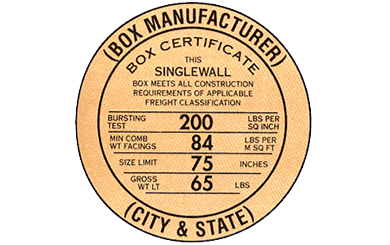 This stamp can usually be found on the bottom flap of a box, and it identifies the material as being “singlewall,” “doublewall” or “triplewall.” The Certification Stamp also specifies if the material has passed the Mullen Bursting Test or the Edge Crush Test. The Mullen Test measures the bursting strength of the corrugated linerboard, while the Edge Crush Test measures linerboard stacking strength. Boxes that have passed either of these tests are comparable in stacking strength, however Mullen Test boxes are better for the protection of heavier contents, while Edge Crush Test boxes provide a lightweight carton with good stacking characteristics. Don’t know which to use? When in doubt, always select the Mullen Test box.